Hyaluronan 2010, the 8th International Conference on Hyaluronan Research, was held at the Brighton Hotel in Kyoto, June 6-11, 2010. 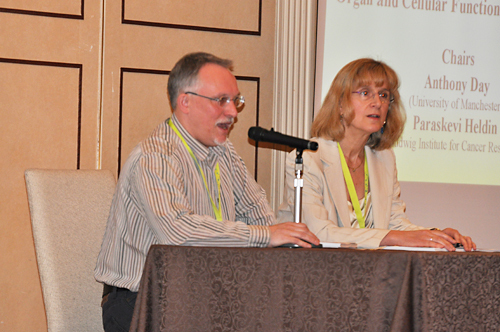 This conference was sponsored by the International Society for Hyaluronan Sciences (ISHAS). 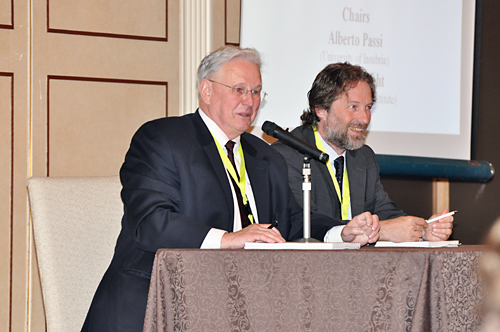 Beyond our expectations, there were more than 300 attendees (164 from 19 countries outside Japan, and 142 from Japan; 181 from institutes and universities and 125 from industries), 84 invited presentations in 17 sessions and 160 abstracts, reflecting the increasing breadth and depth of research on hyaluronan wordwide. This general report focuses on some of the presentations regarding the novel findings and new directions in hyaluronan research. 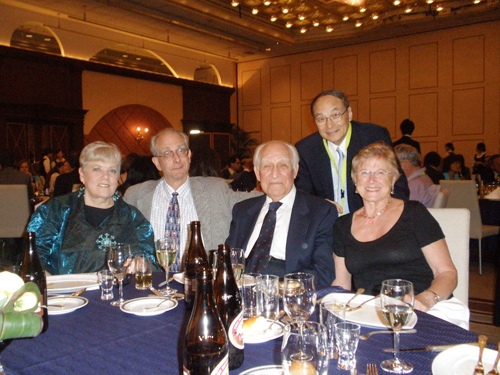 An overview of the Hyaluronan 2010 Conference on the Trends in Glycoscience and Glycotechonology has been reported by Vincent C. Hascall, Bryan P. Toole, Carol de la Motte, Masaki Yanagishita, and Koji Kimata. With the permission of the authors, parts of their valuable comments are cited verbatim numerous times in the present report. 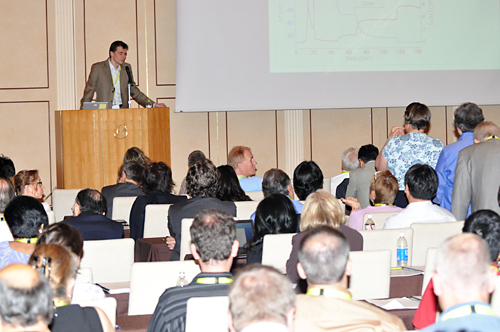 The program and abstracts of lectures and posters in the Hyaluronan 2010 Conference are available on the ISHAS website at http://www.ishas.org. 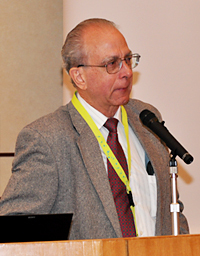 This session presented recently discovered and novel functions and metabolisms of hyaluronan, which are considered as topics of hyaluronan research. Aimin Wang presented data that show that when mesangial cells proliferate in a hyperglycemic medium hyaluronan synthases in intracellular compartments (ER/golgi and transport vesicles) are activated by a PKC signaling pathway. The synthases utilize cytosolic substrates and deposit the newly synthesized hyaluronan in these intracellular compartments, initiating an endoplasmic reticulum stress-driven autophagic response. A marked upregulation of cyclin D3 at the end of cell division initiates extrusion of the hyaluronan and the formation of a monocyte-adhesive matrix. Evidence was provided that hyperglycemia in the streptozotocin diabetic rat model initiates mesangial cell division, autophagy and hyaluronan matrix formation in glomeruli by the same mechanism, and that recruitment of inflammatory cells into this matrix is critically involved in subsequent glomerular nephropathy and proteinuria. This mechanism is likely to occur in most cells that divide in hyperglycemia. Sohkichi Matsumoto described the analysis of the role of hyaluronan after infection with Mycobacterium tuberculosis (MTb). He found that the major hyaluronan synthase expressed in the lung was HAS1, and the expression of HAS1 increased after the infection. Interestingly, the hyaluronan synthesized by HAS1 and HAS3 but not by HAS2 supports growth of MTb, but not Mycobacterium avium. The data suggest that pathogenic mycobacteria utilize an intrinsic host-protective molecule, hyaluronan, to grow in the respiratory tract. Ralf Richter described a new method for end-grafting hyaluronan preparations of defined sizes to a solid-supported lipid bilayer, which was used to create well controlled models of thickness and hydration characteristic of pericellular coats. This method was used to determine how different hyaluronan binding proteins can modulate the physical properties of the hyaluronan films. TNF alpha-stimulated gene 6 (TSG-6) and inter-alpha-trypsin inhibitor (ITI) modify hyaluronan by covalently trans-esterifying the heavy chains from the chondroitin sulfate of ITI to hyaluronan. TSG-6 and ITI contracted and mechanically stabilized the hyaluronan films. In contrast, interaction with the cartilage proteoglycan aggrecan greatly increased the film thickness. This method provides an experimental hyaluronan platform that enables quantitative investigation of interactions of hyaluronan binding and modifying proteins such as CD44 and LYVE-1 with biologically relevant arrangements of hyaluronan. Takeshi Fujiwara showed the first evidence of the involvement of a hyaluronan-CD44 pathway in regulating orientation of mitotic spindle in normal epithelial cells. Regulation of the orientation is important in normal physiological processes, including epithelial tissue branching and neuron generation by asymmetric cell division. Signals from two distinct surface contact sites are required for the orientation of the mitotic spindle axis in normal epithelial cells. This presentation revealed that high molecular weight hyaluronan-CD44 signaling from the apical and basal surface-membranes regulated the orientation of the mitotic spindle axis by aligning parallel and oblique-perpendicular, respectively, to the basal extracellular matrix. There were three reports describing the regulation mechanisms of HASs and three concerning functions and the presence of hyaluronan-degrading enzymes in this session. Alberto Passi described data and proposed some mechanisms to regulate HAS activity by directly measuring hyaluronan synthesis by vesicles prepared from plasma and cytosolic membranes after treatments with either phosphatase to remove phosphates, which inhibits activity, or PNGase to remove O-glcNAc, which increased activity. He also described experiments with AMPkinase, a key sensor of ATP/AMP ratios in cells, which specifically inhibits HAS2 and decreases hyaluronan synthesis. This provides a mechanism for inhibiting the use of ATP for synthesis of the UDP-sugar substrates. Toshiya Nakamura described the effects of 4-methylumbelliferone (MU), a known inhibitor of hyaluronan synthesis, and 12-O-tetradecanoylphorbol-13-acetate (TPA) on O-glcNAcylation/phosphorylation of HAS2. Consistent with the above report by Passi, the results supported a mechanism in which TPA activation of phosphokinase C phosphorylates HAS2, which in turn increases hyaluronan synthesis. Conversely, MU inhibits the phosphorylation by stimulating O-glcNAcylation of the serine/threonine sites involved in modulating HAS2 activity. Shintaro Inoue demonstrated the possible presence of a novel hyaluronan-degradating system apparently independent of Hyal enzymes and the involvement of CD44. This system appeared to be integrated into the cellular machinery. Further investigation may provide new dimensions in our overall understanding of hyaluronan catabolism. There were three presentation addressing anti-nociceptive effects of hyaluronan in joint pain. However, mechanistic insights have not been provided. 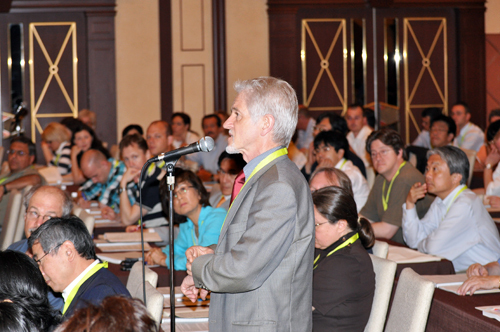 In the previous conference, HA2007, Charleston, most reports of this session had dealt with up/down-expression of hyaluronan synthases and increase/decrease in enzyme activities and message levels of hyaluronidases such as Hyal2 along with development and aging. In contrast, at this conference there were some reports referring to physiological functions of those enzymes and hyaluronan-associating proteins by using knockout or knockdown methods. Yu Yamaguchi investigated individual functions of three hyaluronan synthases, Has1, Has2, and Has3, by taking advantage of single and compound Has mutant mice, based on the idea that those enzymes may have not only overlapping but also some specific functions. Since conventional Has2 knockout mice are embryonic lethal and both Has1 and Has3 knockout mice are largely devoid of developmental phenotypes, they generated conditional Has2 knockout mice as well as compound mutants of three Has genes. Conditional Has2 knockout mice targeted to developing limb buds revealed the roles of Has2-dependent hyaluronan in skeletal growth, chondrocyte differentiation and patterning, and joint formation. Has1/Has2/Has3 triple compound mutants suggested a predominant role of Has2 in hyaluronan synthesis in limb developmental process. Bruno Flamion described novel functions of Hyal2. The phenotypic characteristics of Hyal2 null mice on a C57 BL/6 background were detailed and included high plasma HA, enlarged lymphoid organs, and reduced platelet counts. On the cellular level, data were presented that highlighted a role for Hyal2 in the control of pericellular matrix formation and maintenance. In vitro, Hyal2 was found in lipid rafts associated with CD44 and its associated cytoskeleton interacting proteins ezrin-radexin-moesin (ERM). In fibroblast transfection experiments overexpression of Hyal2 was associated with decreased CD44-ERM interaction, as well as reduction in the levels of these proteins. Correspondingly, HA endocytosis and pinocytosis were reduced and stress fiber formation was increased. Additionally, data were presented demonstrating that Hyal2 was important in promoting cell motility and growth in normal cells, but inhibited survival, motility and invasiveness of malignant MDA-MB231 cells. Sonoko Hatano investigated abnormal cardiac development shown by mice with the deletion mutation in the A subdomain of the versican G1 domain that was shown to be essential to interact with hyaluronan. These mice show decreased deposition of the proteoglycan-hyaluronan aggregate to the ECM. The homozygous embryos with C57Bl/6 background died by E10.5, but those with a mixed background survived in embryonic development and died just after birth with ventrical septal defect. The cells in those presumptive ventricle tissues displayed decreased expression of cardiac differentiation markers including nkx2.5, gata4, cardiac actin, and the α myosin heavy chain, indicating impaired myocardial cell differentiation. In those cells, the levels of Smad1/5/8 nuclear translocation were substantially decreased, indicating downregulation of the BMP signaling. BMPs could be considered as major signals to regulate EMT. The findings indicated that the versican-hyaluronan aggregates were essential for cardiogenesis through BMP-signaling. Satoshi Tanaka reported that the extracellular matrix containing hyaluronan appeared to be microenvironments needed for proliferation of the cells during differentiation and maturation of cutaneous mast cells. He used a model culture system in which bone marrow-derived primary mast cells (BMMCs) were co-cultured with Swiss 3T3 fibroblasts in the presence of stem cell factor. Proliferation during the co-culturing was impaired in BMMCs from CD44-/- mice, although there was no effect on the differentiation of co-cultured mast cells. A significant decrease in the number of cutaneous mast cells was observed in the CD44-/- mice. Those data suggest that CD44 is involved in the regulation of the cutaneous mast cell number. In most of the presentations of this session, inhibition of hyaluronan synthesis with 4-methylumbelliferone (MU) was also successfully employed as an anti-cancer reagent. The inhibitory effect was described for the first time by T. Nakamura in 1995, and at present MU is recognized as the only efficient and specific chemical inhibitor of hyaluronan synthesis and contributes to various aspects of studies on hyaluronan functions. Takahiro Ochiya emphasized the importance of determining the regulatory network responsible for cancer drug resistance in the identification of molecular targets for cancer therapy. They found that RPN2, a part of oligosaccharyltransferase (OST) complex was involved in the docetaxel-resistance in human breast cancer and was highly expressed in CD44+/CD24-/ESA+ breast cancer stem cells. Knockdown of RPN2 in the stem cells resulted in a significant inhibition of cancer cell growth, suggesting that RPN2 could modulate the stem cell specific molecules including CD44. Those data bring us the idea that hyaluronan signaling may be involved in growth potency of cancer stem cells as well as their drug resistance. 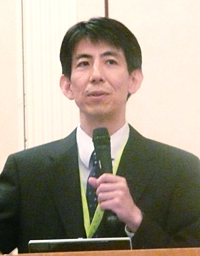 Naoki Itano generated a transgenic mouse model allowing specific expression of both c-neu and hyaluronan synthase-2 in mammary epithelial cells, and in the transgenic mice found not only rapid development of breast carcinoma but also extensive formation of both blood and lymphatic vessels in stroma surrounding tumor cell islets. Interestingly, macrophages were seen to preferentially traffic to the stroma and the macrophage depletion suppressed tumor growth in accordance with the reduced formation of tumor vasculatures. It was suggested that the hyaluronan-rich microenvironment regulate the progression of cancer through the interactions among tumor cells, stromal cells and macrophages. 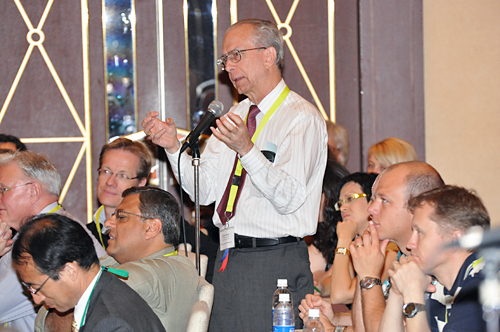 Mark Slomiany discussed the critical role of CD147 (emmprin) in the regulation of hyaluronan production and hyaluronan-CD44 signaling. Flow cytometry sorting of various tumor cell types was used to yield sub-populations with high and low levels of constitutive CD147 expression. The CD147-high cells demonstrated high levels of invasiveness, anchorage-independent growth and drug resistance as compared to CD147-low cells. The CD147-high cells also expressed higher levels of Has2, CD44, receptor tyrosine kinases, drug transporters and lactate transporters at the plasma membrane. These data suggest that CD147 and hyaluronan-CD44 interactions act coordinately to regulate assembly and/or stabilization of plasma membrane complexes that include receptor tyrosine kinases and transporters involved in drug resistance and malignant cell properties. In addition, CD133-positive cancer stem-like cells isolated from human ovarian carcinoma patient ascites expressed similar combinations of proteins at the cell surface. Treatment of the CD133-positive cells with small oligosaccharides of hyaluronan induced dissociation of these complexes and inhibited tumor growth in vivo. Soren Twarock described the importance of hyaluronan in controlling focal adhesions, important for invasive filopodia formation and malignant spread, in esophageal squamous carcinoma cells (ESSCs). Data demonstrated that ESSCs produce a hyaluronan matrix around their invasive filopodia extensions and that HAS3 was the major synthetic enzyme. Alterations in hyaluronan production by either HAS3 shRNA treatment or administration of MU reduced filopodia and focal adhesions, and increased degradation of focal adhesion kinase (FAK). Additionally, blocking the RHAMM receptor with specific antibodies, or RHAMM shRNA resulted in reduction in ESSC proliferation, accompanied by reduced filopodia, FAK cleavage and rapid degradation of focal adhesions. Blocking hyaluronan production by HAS3 and RHAMM recognition of the hyaluronan may be useful in abrogating esophageal cancer invasiveness. Kenichi Harigaya showed that Hyal2 overexpression induced motility of HeLa-S3 cancer cells via generation of hyaluronan fragments, indicating that tumor cell responses are difficult to generalize. Bryan Toole summarized hyaluronan-based therapies in cancer. Among the approaches that currently show promise are a) antibodies and vaccines to specific variants of CD44 that are uniquely expressed at critical stages of progression of a particular cancer; b) hyaluronidase-mediated reduction of barriers to drug access; and c) small hyaluronan oligosaccharides that attenuate constitutive hyaluronan-receptor signaling and enhance chemosensitivity. In addition, he indicated that hyaluronan is being used for targeting of anti-cancer agents to hyaluronan receptor-expressing tumor cells. In this context, hyaluronan is being exploited as a) a drug delivery vehicle itself, b) a tag conjugated to other drug delivery vehicles, or c) a tag conjugated to chemotherapeutic drugs. Hiroshi Urakawa described experiments in which MU was shown to decrease hyaluronan synthesis and downregulate mRNA expression of HAS2 in breast cancer cells in vitro. MU also suppressed hyaluronan matrix accumulation and progression of osteolytic tumor lesions in vivo in a bone metastatic mouse model. Suniti Mistra focused on the cross-talk between cancer cells and the stromal cells in their microenviroment in colon cancer. Data suggested that the malignant transformation led to increasing hyaluronan synthesis in the pericellular matrix surrounding tumor cells, overexpression of CD44v6, a splice variant of CD44, and overexpression of HGF in the the stromal myofibroblasts, which stimulated growth factor-receptor tyrosine kinase (RTK). Thus, cross-talk between those molecules sustained hyaluronan/CD44v6/P13K signaling that promoted invasiveness in colon cancer cells. The idea that most tissues contain stem or progenitor cells is now widely accepted and being verified, leading to rapid progress in trials of regeneration of even neural tissues, where extracellular matrices consisting mainly of hyaluronan may play important roles in the regulation of cellular differentiation and tissue morphogenesis as microenviroments (“niche”). This emphasizes the great necessity and importance of hyaluronan study in this field. Larry Sherman presented data showing that hyaluronan accumulates in neural stem cell niches and regulates progenitor cell proliferation and differentiation through interaction with CD44. Examination of CD44-null mice showed that these mice express hippocampal learning and memory deficits, consistent with a role for hyaluronan-CD44 interactions in this area of the central nervous system (CNS). Additional data were presented showing that progenitor cells entering areas of injury in the CNS express hyaluronidases and that products of hyaluronidase activity promote proliferation and inhibit maturation of progenitor cells. Collectively, the data from this group indicate an important role for hyaluronan-CD44 interactions in neural progenitor cell behavior. Sophia Khaldoyanidi presented data suggesting the importance of hyaluronan in regulating human embryonic stem cell (hESC) differentiation pathways. Hyaluronidase digestion of hyaluronan in hESC cultures decreased the numbers of hematopoietic progenitors and mature hematopoietic cells, and also diminished the numbers of CD31+ endothelial cells, stromal fibroblast-like cells and contracting myocytes. Consistent with these results, mRNAs for mesoderm markers (T-brachyury and BMP2) and for endoderm markers (α-FP and Sox17) were decreased while those for ectoderm markers (GFAP and FGF5) increased. Tonya Caralla described experiments that show that connective tissue progenitor cells (CTPs) in iliac bone marrow aspirates have pericellular hyaluronan matrices while the large populations of other nucleated cells in the aspirates do not. Magnetic beads coated with a hyaluronan binding protein were used to label the cells, and magnetic separation techniques were used to fractionate them. The CTPs were enriched ~2.7-fold in a three pass purification protocol-applied hyaluronan-positive fraction with depletion of the vast majority of the other nucleated cells. Approximately 80% of the hematopoietic progenitor cells (HPCs), both myeloid and erythroid, segregated in the first hyaluronan-negative fraction with very few remaining in the hyaluronan triple positive fraction. The method provides a clinically useful method for enriching CTPs for bone graft transplants. James Fawcett discovered the role of chondroitin sulfate proteoglycans (CSPGs) in restricting CNS plasticity several years ago. Since hyaluronan was one component of perineuronal nets (PNNs) and expressing HAS3 and cartilage link protein in HEK cells caused them to produce a PNN-like condensed matrix, incorporating their own or exogenous chondroitin sulfate proteoglycans (CSPGs), he suggested that both axon regeneration and plasticity in the CNS could be regulated in many ways, such as by down/up-regulation of the formation of PNNs. Hiroko Yamanokuchi further investigated neurotrophic activity of hyaluronan tetrasaccharide (HA4), because her group observed previously that HA4 could mitigate the symptoms of experimental autoimmune encephalitis and accelerate the curing process of spinal cord injury. In this report they showed that HA4 up-regulated the neurite outgrowth and differentiation of PC12 cells in culture, and that HA4 accelerated the sprouting and outgrowth of regenerating axon from dissected nerve cells by establishing a film model that enables the microscopic observation of axon regeneration in vivo. The most successful effects in therapeutic application of hyaluronan could be in the mitigation of pain and the functional recovery of damaged articular joints in OA patients by direct injection of hyaluronan into the joint cavity. However, the mechanisms are still not fully elucidated. Most of the reports in this session addressed this problem. A growing body of evidence suggests that chondrocytes actively produce reactive oxygen and nitrogen species capable of causing mitochondrial dysfunction and mitochondrial DNA damage resulting in cellular dysfunction and death. Valentina Grishko hypothesized that the chondroprotective effects of hyaluronan on oxidatively stressed chondrocytes are due to preservation of mitochondrial function and amelioration of mitochondria-driven apoptosis. Data obtained from the cultures exposed to reactive oxygen or nitrogen species generators in the presence or absence of hyaluronan totally support this hypothesis. Interaction of hyaluronan with CD44 was involved in the chondroprotective effects because pre-incubation of OA chondrocytes with anti-CD44 antibodies almost completely blocked the protective effects of hyaluronan. Ken Nakata evaluated the effect of mechanical stimulation and hyaluronan on the remodeling and chondrogenic differentiation of a three-dimensional construct containing human synovium-derived stem cells. Cyclic loading increased aggrecan and Sox 9 mRNA expressions, and hyaluronan synergistically increased these mRNA expressions. Cyclic loading also upregulated CD44, TGF-β1, and HAS2 mRNA expressions. They concluded that synergistic effects of mechanical stimulation and hyaluronan signaling are important for remodeling and differentiation of chondrocytes. Warren Knudson investigated whether the enzymatic cleavage and shedding of CD44 from the surface of chondrocytes may be the naturally-occurring agent responsible for the loss of the hyaluronan and proteoglycan-rich pericellular matrix observed in osteoarthritic cartilage. In progressively de-differentiated chondrocytes, CD44 shedding was detected, accompanied by the loss of the pericellular matrix, and mRNA for MT1-MMP, MT4-MMP, ADAM10 and ADAM17 were all upregulated. Interestingly, upon re-differentiation of these chondrocytes in alginate beads the shedding progressively diminished, and all protease expression levels dropped. The shedding also diminished in the incubation with a MMP inhibitor and a γ-secretase inhibitor and by the inhibition of CD44 transit into lipid rafts. Lastly, chondrocytes derived from human OA cartilage were shown to express substantial levels of the shedded CD44, compared to those obtained from normal cartilage, suggesting the above possibility. Recent progress in research on cardiovascular and lymphomyeloid systems has revealed that the hyaluronan-rich extracellular matrix is also largely involved in the regulation of the cellular differentiation in those systems as an important microenvironment factor (niche), confirming us that hyaluronan study from this aspect is also essential in these research fields. Paul Bollyky described data showing that large molecular weight hyaluronan can act as a contextual cue in the extracellular matrix of uninjured tissue, which can guide T-cell populations to recognize molecules in their environment to which they should not react immunologically. High molecular weight HA was shown to induce production of TGF-β and an anti-inflammatory cytokine, IL-10, by T cells. Using CD44 null mouse T cells, as well as CD44 antibody blockade, it was shown that this induction was mediated by CD44. The concept that immunologic tolerance can be mediated by high molecular weight HA and that this may be achieved via simultaneous crosslinking of multiple CD44 receptors was introduced. Jens Fischer described experiments using 4-methylumbelliferone (MU), an inhibitor of hyaluronan synthesis, in vivo in apoE-deficient mice, a model of atherosclerosis. Hyaluronan concentration in plasma and content in the aortic root were significantly decreased by MU treatment, indicating its effectiveness in inhibiting hyaluronan synthesis. However, contrary to expectations, atherosclerotic indicators were significantly increased after 11 and 21 weeks of treatment with MU as indicated by increased plaque burden (Oil Red O staining), elevated macrophage content (thioglycolate IP), increased acetylcholine-induced relaxation of aortic rings, increased mean arterial blood pressure, and shorter times to occlusion in thrombotic responses. The effects were specific for atherosclerosis since MU did not alter neointimal hyperplasia responses to ligation of the left carotid artery. A possible mechanism was uncovered by electron microscopy, which revealed severely damaged endothelial cell glycocalyces in myocardial capillaries after MU treatment, which likely increases chronic vascular inflammation and acute inflammatory responses. The results suggest that an active steady state of hyaluronan metabolism (synthesis and catabolism) is necessary to maintain normal endothelial cell glycocalyx structure and function. 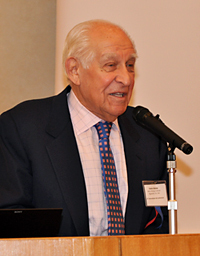 Carlo Ventura demonstrated that injection of hyaluronan mixed esters of butyric and retinoic acid (HBR) into infarcted rat heart afforded substantial cardiovascular repair and recovery of myocardial performance without the need of stem cell transplantation. The HBR action was associated with an increase in the number of Stro-1-positive cells within the injected myocardium. In isolated cardiomyocytes and Stro-1 stem cells, HBR enhanced not only the transcription of vascular endothelial growth factor, hepatocyte growth factor, kdr, akt, and pim-1, but also the secretion of vascular endothelial growth factor and hepatocyte growth factor. When exposed to HBR, histone H4 acetylation, which involves the activation of a gene program of paracrine patterning for myocardial protection and angiogenesis, significantly increased in those cells. Hyaluronan itself showed much less activity compared to HBR, but the hyaluronan scaffold of HBR appeared to be essential for the expression of the HBR activities. Inflammation and immunity are now being viewed in a new light as physiological phenomena where hyaluronan is greatly involved. Recent findings of a variety of hyaluronan-binding proteins indicate that these proteins affect hyaluronan functions in a variety of fashions. Typical examples were presented in this session. Carol de la Motte reported that feeding mice with hyaluronan of MW ~35 kDa (HA-35) protected mice from bacterially induced intestinal inflammation. Data were also presented that showed that intestinal epithelium in vitro and in vivo specifically upregulated expression of antimicrobial peptide b-defensin2 protein in response to HA-35, but not to smaller (~4.7 kDa) or larger (~2000 kDa) hyaluronan. HA-35-treated intestinal epithelial cells were also protected from Salmonella infection. It was also reported that human milk contains hyaluronan, which was able to induce expression of b-defensin2 protein in epithelium, and its size fell in the range of the HA-35. The data support the model that hyaluronan in milk may provide part of the maternal protection of infants associated with breastfeeding, and suggest that HA fragment administration may be an adjunct protective therapy for children and adults who are susceptible to bacterial infection. Stavros Garantziotis presented the intriguing concept that mechanical forces can induce a HA-dependent pathway of epithelial to mesenchymal cell transformation (EMT), a process that contributes to fibrosis in many pathological conditions including lung disease. The data presented showed that small molecular weight HA is sufficient to transform alveolar epithelial cells in vitro, and suggested that TLRs and the Wnt signaling pathway are critical elements for EMT in mechanically stretched epithelium. Rashmin Savani reported that RHAMM knockout mice are protected after bleomycin-induced lung injury. RHAMM (CD168) is recognized as a hyaluronan receptor, but its physiological functions are still obscure. Intratracheal bleomycin treatment in littermate wild type mice resulted in decreased body weight, and increased respiratory rate by d7-10, whereas the treatment in RHAMM knockout mice had less weight loss and respiratory rates. Compared to the wild type animals, RHAMM knockout mice had lower lavage concentration of hyaluronan, lower neutrophil levels and macrophage enzyme activities after the induction. The expression of Surfactant Protein B (SPB), which caused respiratory distress, decreased in injured wild type animals, but no change in SPB expression was seen in injured RHAMM knockout mice. Kenichi Harigaya investigated the role of CD44 in inflammation using a zymosan-induced arthritis model in CD44-deficient mice. In recent years, signaling pathways of TLRs (toll-like receptors) have been shown to initiate innate immune responses linked to a variety of inflammatory diseases, and to have pivotal roles in zymosan-induced arthritis, and zymosan is one of the ligands for TRL2. The study indicated that CD44 suppresses in vivo inflammation mediated by TLRs via NF-κB activation, which leads to proinflammatory cytokine production. Furthermore, it was shown that CD44 directly associates with TLR2 via its cytoplasmic domain when stimulated by zymosan. Overall, this report demonstrated that CD44 plays a protective role in TLR-mediated inflammation and is the first to demonstrate a direct association between CD44 and a TLR. Shigeo Shibatani described interesting experiments in which the chlorovirus hyaluronan synthase (cvHAS) gene was stably transfected into tobacco BY-2 cultured cells, which synthesized and secreted hyaluronan continuously. Tobacco plants were also stably transfected with cvHAS and co-transfected with L-glutamine-fructose-6-phosphate amido-transferase (GFAT) and UDP-glucose dehydrogenase, key enzymes for synthesis of the HAS substrates, UDP-glcNAc and UDP-glcUA. Hyaluronan was then isolated in substantial quantities from tobacco leaves. In this session, representative works on the role of hyaluronan not only in organ functions and cellular activities but also in causing some pathological states due to its abnormal expression were demonstrated. Paul Weigel reported detailed relationships between activities and structures of the 315 kDa and 190 kDa isoforms of HARE (Stabilin-2) that he originally identified as the hyaluoran receptor for endocytosis. The 315 kDa HARE, a full-length HARE is a membrane protein, and the 190 kDa HARE, derived by proteolysis, is the C-terminal portion of the 315 kDa isoform. Both isoforms are highly expressed in sinusoidal endothelial cells of liver, lymph node, spleen, and bone marrow, which are known to be sites responsible for high endocytotic degradation of hyaluronan. Most ligand binding sites were within the 190 kDa isoform that contained N-glycans. They created stable cell lines expressing membrane-bound HARE or soluble ecto-domain variants lacking Link domain N-glycans. Interestingly, the membrane-bound HARE variant mediated rapid hyaluronan endocytosis, similar to the wild type. However, purified 190 kDa HARE ecto-domain showed little or no hyaluronan binding. The results suggest that Link domain N-glycans are needed for hyaluronan binding to soluble ecto-domain but not for endocytosis of hyaluronan. Evi Heldin described experiments that showed that mono-ubiquination of lysine 190 in HAS2 suppressed activity, and that dimerization of HAS2 appears necessary for activity. Connie Tolg described screens of random phage libraries using hyaluronan-Sepharose beads that isolated 65 clones that contained only two peptides, each with amino acids that are present in RHAMM and involved in hyaluronan binding. One of the peptides inhibited RHAMM induction of cell migration in wild type mesenchymal cells but not in RHAMM null mesenchymal cells. The peptide also inhibited macrophage infiltration, blood vessel density and collagen accumulation in an excisional wound healing model, implicating the potential use of the peptides clinically. Robert Steadman showed data that highlighted a role for the hyaluronan pericellular matrix in myofibroblast differentiation and maintenance, a process that contributes to pathologic fibrosis. TGF-β promotes two mechanisms of myofibroblast differentiation, epithelial to mesenchymal cell transformation and fibroblast differentiation. Myofibroblasts have an extensive hyaluronan pericellular matrix while fibroblasts do not. The evidence presented support a pathway whereby TGF-β, through EGF induction, promotes HAS2 expression as well as hyaluronan production. The hyaluronan, via interaction with CD44, induces smooth muscle actin, a hallmark of myofibroblasts, and EGF receptors, which help maintain the myofibroblast hyaluronan pericellular matrix and therefore the phenotype. Akira Asari showed that feeding mice that have an autoimmune phenotype (MLR-lpr/lpr) with 900 kDa HA (HA900) led to suppression of the pathological lymph node enlargement and upregulation of the anti-inflammatory cytokine, IL-10, as well as decreased expression of inflammatory cytokines. In vitro data identified ways in which HA900 may act. Treatment of intestinal epithelial cell cultures 1) increased SOCS3, a factor known to decrease inflammatory cytokine effects while promoting anti-inflammatory cytokine production, and 2) decreased pleiotrophin, a factor that can inhibit leukocyte cell death. The data supported a role for TLR4 in the responses to HA900. Large molecular weight HA may be anti-inflammatory, as currently understood, because of its ability to regulate Th1 - T cell responses. The effectiveness of oral administration of HA900 as well as the signaling of intestinal epithelium in vitro implicates the epithelium in the control of immune responses. Skin is the most typical tissue abundant in hyaluronan and its physiological function can easily be recognized from the surface. This tissue has a relatively simple cellular construct compared with other tissues and organs, and has been a target of tissue regeneration with a long study history. Recent data were presented in this session. Megumi Tobiishi et al. demonstrated that UVB irradiation caused remarkable changes in the amount, molecular mass and localization of hyaluronan, which probably resulted in cell proliferation and differentiation of keratinocytes. Upregulation of epidermal hyaluronan by UVB irradiation is mainly regulated through increased expression of Has3 mRNA. Yoshimitsu Kuroyanagi developed an allogeneic cultured dermal substitute (CDS) composed of a collagen spongy matrix containing fibroblasts which could effectively promote healing of full-thickness severe skin defects such as chronic ulcers and burn injuries. Cultivation of fibroblasts on a 2-layered spongy matrix of hyaluronan and collagen yielded an advanced version of CDS by resulting in a high capacity of hydration and promoting cell migration and proliferation. Also, the fibroblasts incorporated in this CDS were able to release cytokines, including VEGF, bFGF, and HGF that are essential for angiogenesis. Edward Maytin found that cutaneous inflammation in response to phorbol esters or excisional wounding was exaggerated in mice doubly targeted in Has1 and Has3 genes (Has1/3 knockout mice). Amounts of hyaluronan in the dermis were significantly lower in Has1/3 knockout mice than in wildtype mice. In response to TPA, an inflammatory agent, wildtype mice showed increased accumulation of hyaluronan in the epidermis. In TPA-treated Has1/3 knockout mice, induced accumulation of hyaluronan failed to occur. Despite the absence of detectable hyaluronan, epidermal hyperplasia was robust in the TPA-treated Has1/3 knockout mice. In the dermis, a marked increase in the influx of circulating leukocytes was noted in Has1/3 knockout mice, relative to wildtype controls. These results suggest that the loss of functional Has1 and Has3 expression and subsequent changes in hyaluronan-regulated signaling produce a cutaneous inflammatory phenotype in which neutrophil chemotactic responses after topical irritation or surgical wounding are selectively enhanced. Noboru Mizushima, Professor of Tokyo Medical and Dental University, who was invited as a special lecturer presented his recent findings on the physiological role of autophagy and its regulation mechanism. He identified the ATG genes which are required for autophagosome formation, then, taking advantage of mice with gene null mutation, found that degradation of intracellular proteins by autophagy was critical to produce the necessary amino acids during starvation and preimplantation development. He also found that constitutive basal autophagy was important for intracellular protein quality control and defect in the liver-specific Atg5 gene caused the development of multiple tumors in the liver. Since recent findings have revealed intracellular synthesis of hyaluronan in some cases (see Aimin’s presentation in Session 1), autophagy may be greatly involved in hyaluronan metabolism. A banquet was held on Wednesday evening. Drs. 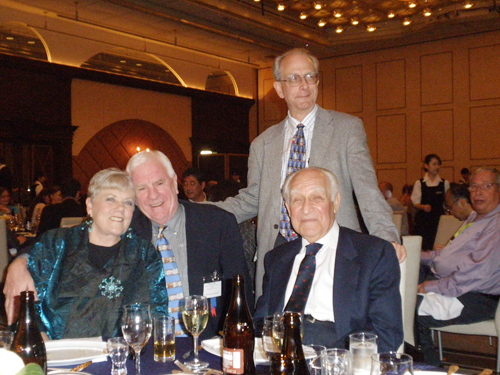 Balazs and Hascall, two very important persons for the ISHAS, were congratulated for their 90th and 70the birthdays. There was free time on Wednesday afternoon. 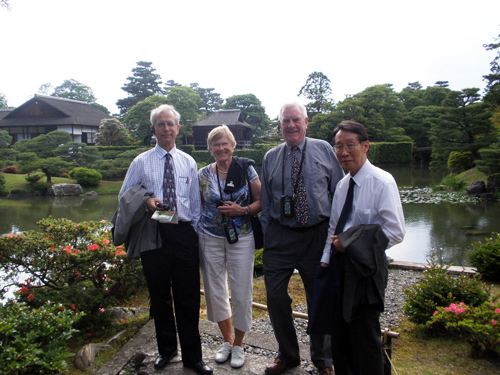 Most attendees left the conference venue and enjoyed the ancient city. Some photographs are shown below. 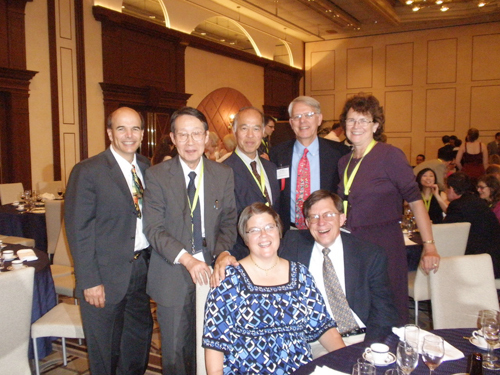 3) Dr. Paul DeAngelis, Dr. Koji Kimata, Dr. Masaki Yanagishita, Dr. Paul Weigel, Dr. Janet Weigel (from left).